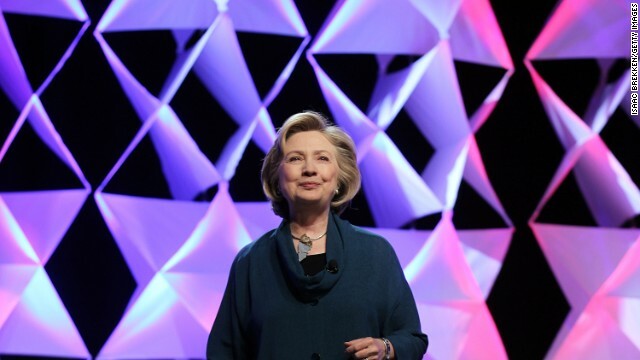 Washington (CNN) – Former Secretary of State Hillary Clinton, who has been dogged by Republican questions about her health and age as she mulls a run at the presidency in 2016, told ABC in an interview on Friday that her health is "very good." Clinton added that she had "no lingering effects" from a late-2012 health scare in which she suffered a blood clot as the result of a fall. Karl Rove, the well-known Republican strategist, questioned whether Clinton was healthy enough to run for president, something the former first lady is admittedly considering. If she runs, Clinton said she would release her medical records. "I would do what other candidates have done, absolutely," she told ABC's Diane Sawyer in a clip that aired Friday. The full interview, which is part of Clinton's upcoming memoir tour, will air on Monday, June 9, the day before "Hard Choices" hits bookshelves. In the interview, Clinton described the fall and the recovery at length. "It was, I think, a serious concussion," Clinton said. "Because of the force of the fall, I had double vision for a short period of time and I had some dizziness." She said she did not have headaches or any trouble talking. Because of Clinton's history of blood clots - she suffered a large blood clot behind her right knee and was rushed to Bethesda Naval Hospital outside Washington in 1998 - the former senator said she will probably be on blood thinners for the rest of her life. Clinton also responded to questions about Bowe Bergdahl, the American soldier who was held by the Taliban for five years. The Obama administration traded five detainees from the prison in Guantanamo Bay for the soldier. Some have questioned the circumstances around Bergdahl's capture, and the prisoner trade has raised a number of questions among lawmakers and pundits. Clinton, however, backed the trade in the interview. "If you look at what the factors were going into the decision, of course there are competing interests and values," she said. "And one of our values is we bring everybody home off the battlefield the best we can. It doesn't matter how they ended up in a prisoner of war situation." She added, "It doesn't matter. We bring our people home." In the three-minute clip, Clinton also took on multiple Republican critics of her age and health. Clinton has no ill words for Rove, President George W. Bush's close aide and senior adviser. "I know he was called Bush's brain in one of the books written about him and I wish him well," Clinton said with a laugh. Clinton joked about a comment made by Senate Minority Leader Mitch McConnell, who said the Democratic field in 2016 looks like "a rerun of the 'Golden Girls,'" a 1980s sitcom about older women who were divorced or widowed. "That was a very popular, long-running TV series," she said. @wes, care to elaborate. Even the faux news half brain puppets lie about the truth. Oh, the never ending drama. Of course she will release her medical records if she runs. Gee, is there anything Hillary can do in life that someone is not going to criticize? Sorry Mrs Clinton, but I can never forgive NAFTA and the lost of millions of jobs. If Hillary Clinton agrees with this massive disaster of a trade then she is not in agreement with nearly 60% of America. It is clear she would be just as big of a disaster for this country as Obama has been. You have been warned America. Don't ignore the signs and believe the propaganda.
. I can't see anyone coming close to her in the election if she chooses to run. That is the problem for the Republicans. They are running scared and will " try " to use anything against her that they think might work. Unfortunately, we have a lot of people in this country who never check anything out themselves. They just lead their lives by negativism and will believe anything that is fed them. That is certainly a non answer. Some candidates released nothing, others released recent physicals. One refused to release his college records or explain funding for trip through Muslim countries. McConnell really made a comment about The Golden Girls? Those Repubs will apparently never understand how their words demean women.